One Sunday we went for a drive and stopped along the shore of Lough Derg in County Donegal. We got out of the car and wandered along the edge of the lough. Gazing across the water I spotted a huge grey complex on an island. It was a breezy March day and there was no sign of life on the island. I wondered whether the buildings were a long deserted monastery or church, although not decrepit the complex looked old. When I got home and did some research I found that what I’d seen was St Patrick’s Purgatory, Lough Derg, a place of pilgrimage that is visited by thousands each summer. Curiosity got the better of me and I later visited the island and wrote about it for Ireland’s Own magazine. That same curiosity also pulled me to two monasteries in Ulster to find out a bit about them. The result of that curiosity and nosing around is Irish Sanctuaries, a collection of articles about three places that are considered holy in the Christian tradition, a place of pilgrimage and two monasteries: St Patrick’s Purgatory, Lough Derg, Co Donegal; the Graan Monstery, Co Fermanagh and Holy Cross Monastery, Rostrevor, Co Down. Each of them is considered a sacred place and a refuge, welcoming all who come to them, whether they come to pray and meditate, seek spiritual guidance or, following the Catholic tradition, for penance and reconciliation. I’m sure many people, like me, feel that monasteries and places of pilgrimage have an aura of mystery about them and they would like to understand them better. In Irish Sanctuaries I’ve tried to provide a glimpse inside their world and their ministries. 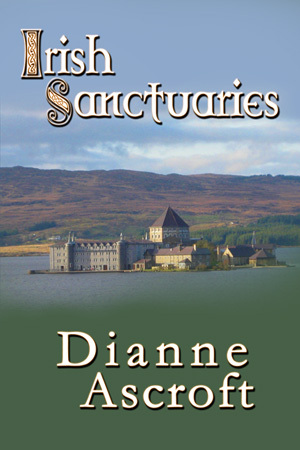 Irish Sanctuaries is available as an ebook on Amazon. This entry was posted in Uncategorized and tagged Benedictine monastery, Dianne Ascroft, Graan Monastery, Holy Cross Monastery, Irish Sanctuaries, Lough Derg, monasteries, places of pilgrimage, St Patrick's Purgatory. Bookmark the permalink.